The city of Hyderabad house a number of places of interest. Starting from historical places of visit to the beauty of nature, the city has all. One on side, the age old monuments along with the museums portray the glorious past of the city whereas, on the other, the beauty of the place gets reflected from its lakes, parks and landscaped gardens. 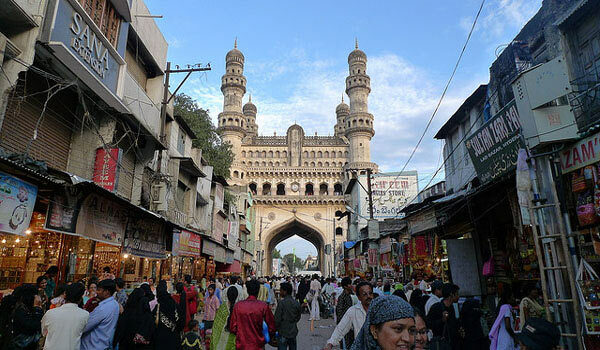 The inherent cultural history of Hyderabad is apparent for its monuments, mosques, temples, diverse art forms and crafts, endearingly called the Pearl City.Some of the tourist attractions include Charminar, Jama Masjid, Golconda Fort, Salarjung Museum, Osmania University, Paigah Tombs, Qutub Shahi Tombs, Raymond Tomb, Birla Mandir, Hussain Sagar, Ramoji Film City, etc. The Charminar is the chief palace of Hyderabad, was built in 1591 by Mohammed Quli Qutub Shah towards the heart of the city. It is considered as a fine model of Cazia style of architecture, made of granite and lime-mortar. Tourists can view the architectural brilliance inside the Charminar and can also have the bird’s eye view of the lively city of Hyderabad from here. 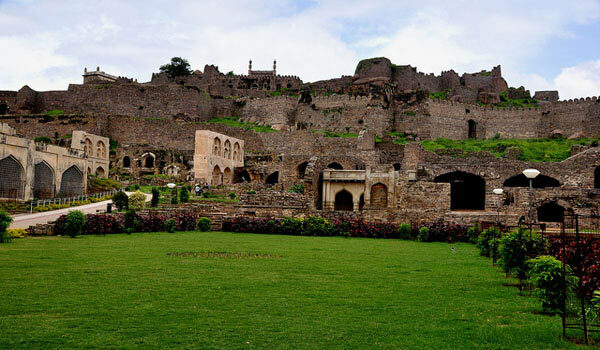 Golconda is one of the famous forts of India located towards the western outskirts of Hyderabad. 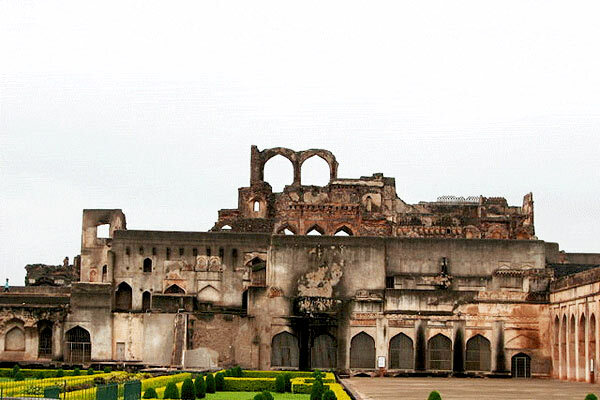 The fort is prominent for its acoustics, palaces, ingenious water supply system and the famous Fateh Rahben gun, one of the cannons used in the last siege of Golconda by Aurangzeb, is an important exhibit of this fort. 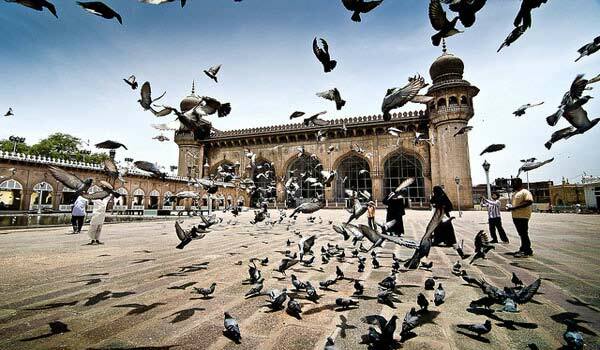 Mecca Masjid is an admired tourism attraction of Hyderabad which is sited towards the south-west of Charminar. 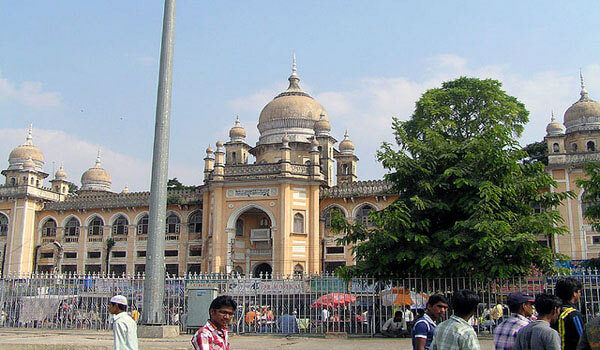 Mecca Masjid is one of the oldest and the biggest of all mosques in Hyderabad. It is renowned for its fabulous architecture. Mecca Masjid was named so because the bricks were brought from Mecca to build the central arch. The hall of Mecca can accommodate about 10,000 people at a time. Salar Jung Museum is one of the chief attractions of Hyderabad that showcases various collections of antiques from all over the world. The Museum displays the artifacts which comprises of Chinese Porcelain, stilettos and other belongings of Queen Noor Jehan, daggers of Mughal Emperor Jahangir and Shah Jahan, Sword of Mughal Emperor Aurangazeb, statuettes, Indian canvases and Persian carpets. The Paigah Tombs located at the Pisal Banda Suburns, are among the marvel of Hyderabad and their splendid artistry are shown in their inlaid mosaic tile work. 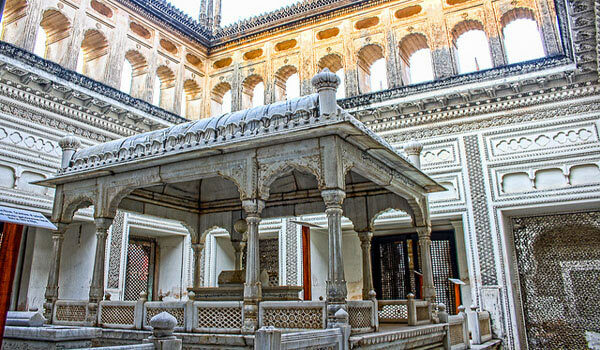 The Paigah Tombs are skillfully carved and enclosed in pierced marble facades. They are the finest model of Indo-Islamic architecture, exhibiting both the Asaf jah and Rajputani style of architecture. 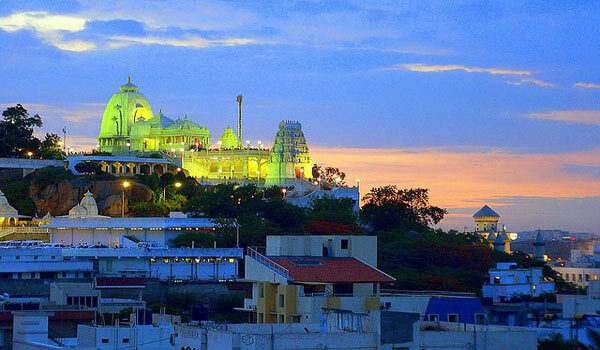 Birla Mandir is entirely made of marble that stands in its magnificence at Kala Pahad, a small hillock in Hyderabad. The temple manifests a blend of South Indian Rajasthani architectures. The temple is dedicated to Lord Venkatsewara, also known as Balaji in the north. The scenes from Indian epics The Mahabharata and Ramayana are finely realized in pure white marble. 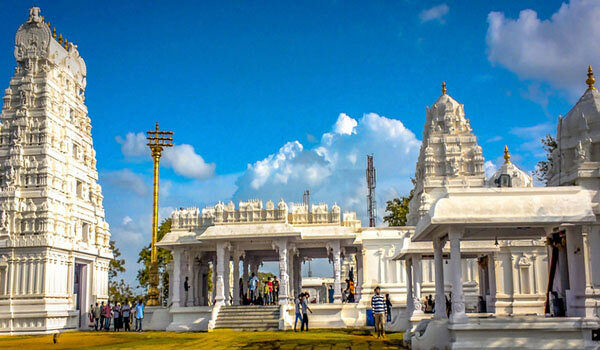 Chilkur Balaji Temple is one of the oldest temples of Hyderabad, placed in Chilkur village on the banks of Osman Sagar Lake near Hyderabad and 17 km away from Mehdipatnam. 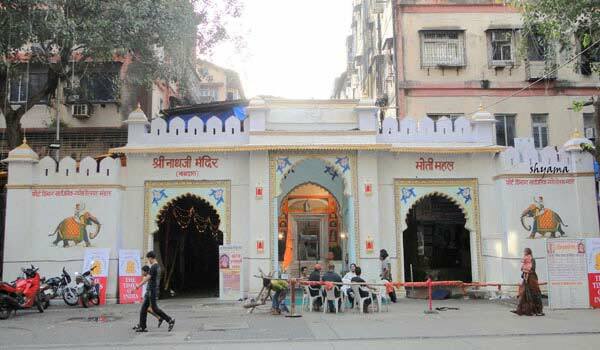 It is also known as Visa Balaji Temple. Chilkur Balaji Temple is constructed in the South Indian style of temple architecture. 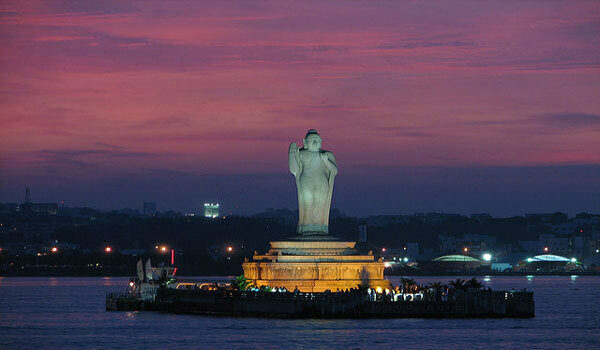 Hussain Sagar Lake is one of the admired lakes in the city of Hyderabad. It is the largest artificial lake in Asia. One of the World’s tallest monolithic statues of the Buddha stands on the Rock of Gibraltar, stands in the middle of the lake. Hussain Sagar Lake is a major leisure spot. Boating and water sports are a regular feature of the lake. 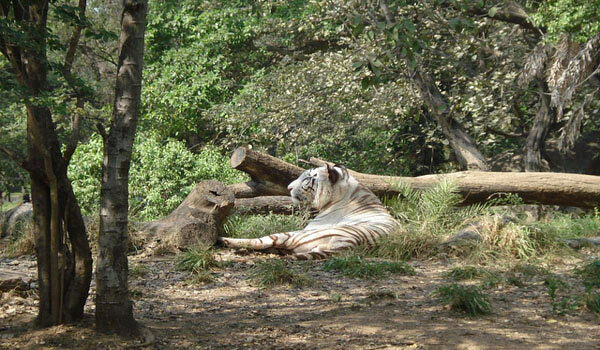 The Nehru Zoological Park is a wildlife sanctuary situated in Bahadurpur area, Hyderabad. It offers elephant rides and safari trips like lion safari, tiger safari, black beers safari, etc. There is also the option of going to a jeep safari for the more adventurous tourist. The park also has a Natural History museum that educates the young kids about the importance or the animals to the world. 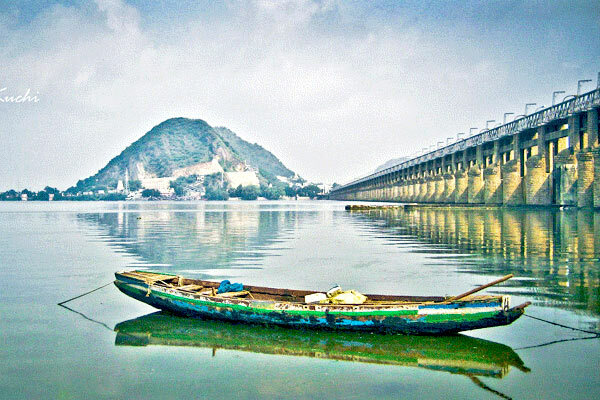 Durgam Cheruvu is a freshwater lake situated in Rangareddy district of Hyderabad. 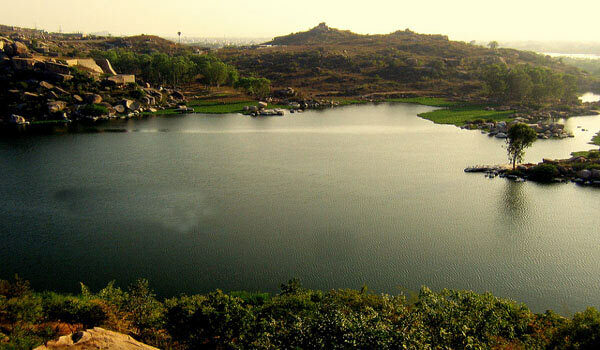 The lake is also known as Secret Lake because it is concealed between the locality of Jubilee Hills and Madhapur. Adventure activities like rock climbing, trekking, rappelling, an art gallery and a sculptor park are the attraction of the place. Laad Bazaar is the famous, colorful shopping centre Hyderabad, tucked away in one of the streets leading off from Charminar. Bridal Wear, Pearls and the traditional Hyderabadi glass and stone studded bangles are the very unique here. 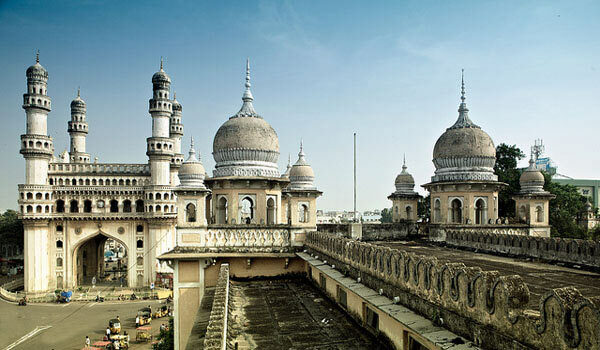 It is truly one of Hyderabad’s most enduring and historical legacies. 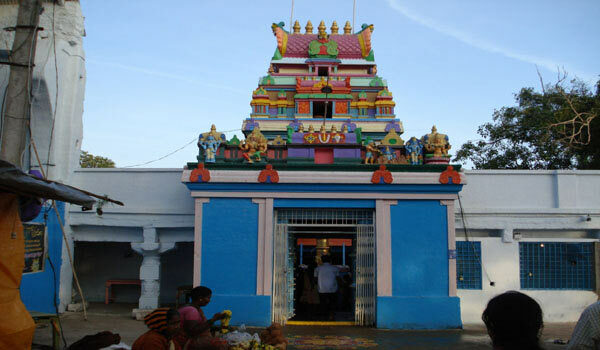 Sanghi Temple in Hyderabad is a famous temple located on the hillock named Paramananda Giri. The temple complex is located on the top of Paramanand Giri hill, beauty of the slope around the temple is a popular view among its visitors. The temple is constructed in South Indian style of temple architecture. 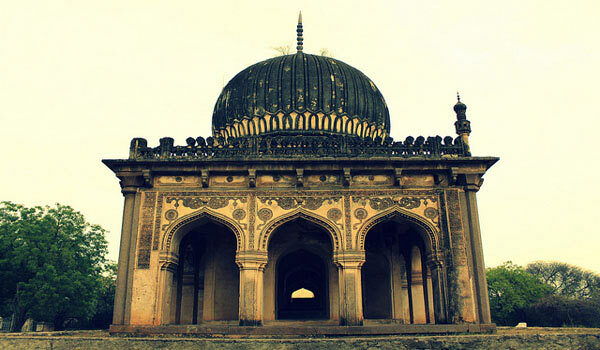 The Qutub Shahi Tombs is located about a kilometer away from Banjara Darwaza of the Golconda Fort. These tombs are said to be the oldest historical monuments in Hyderabad. The Qutub Shahi Tombs exhibit a unique blend of Persian, Pathan and Hindu architectural styles using grey granite, with stucco ornamentation. 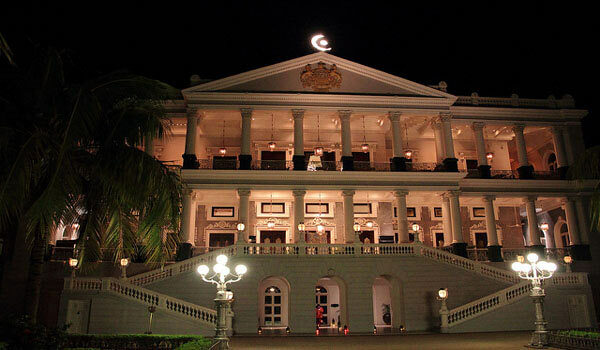 Falaknuma Palace is one of the finest palaces in Hyderabad, also known as Star of Heaven. The palace was built in the shape of a scorpion with two stings spread out as wings in the north. The Falaknuma palace is a rare blend of Italian and Tudor architecture was constructed by Nawab Vikar-ul-Umra Bahadur. 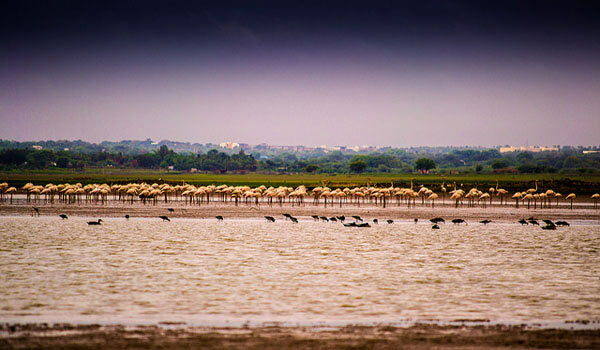 Lovingly known as Gandipet, the Osman Sagar Lake located on the outskirts of Hyderabad is an excellent picnic spot. 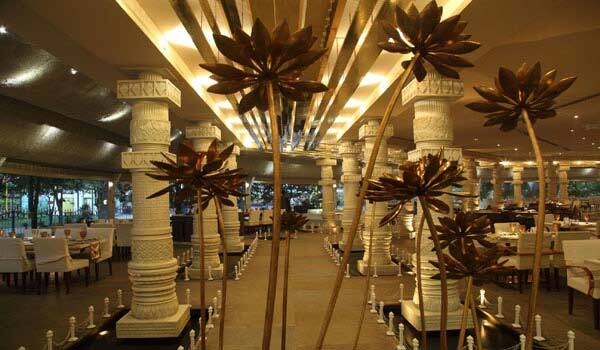 Adjacent to the lake are lush gardens that provide the ideal ambiance for an outing. 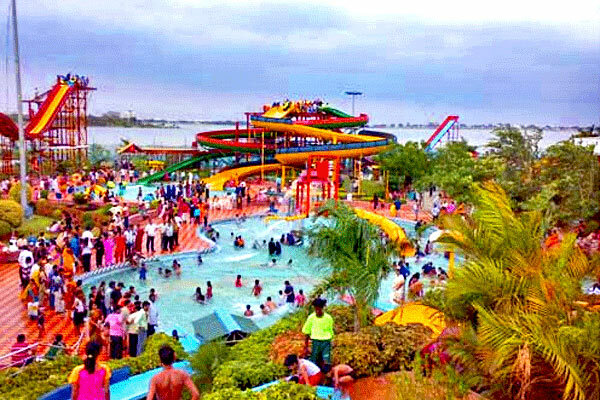 Other attractions within the lake include Treasure Island, Elless World, and Ocean Park. 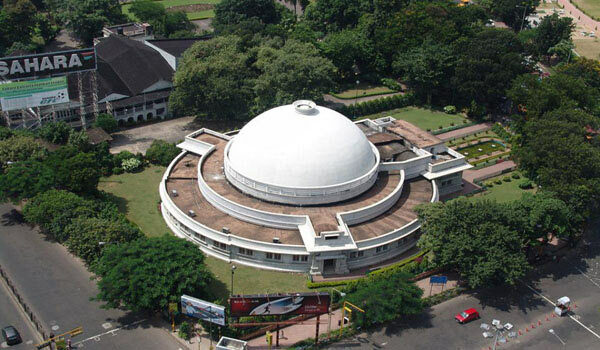 Birla Planetarium is India’s most up to date planetarium and first of its kind in the country, equipped with advanced technology from Japan and is built on Naubat Pahad adjacent to Kala Pahad. And the Science Museum stands tribute to the advancement achieved by Science and Technology. 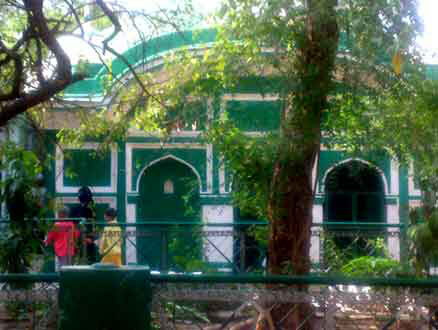 Chote Hazrat Ki Dargah located inside the Devan Devadi is prominent Dargah in Hyderabad. Chote Hazrat Ki Dargah is a holy pilgrimage center not only for Muslims within the twin cities but also for Muslims coming for other parts of the country. 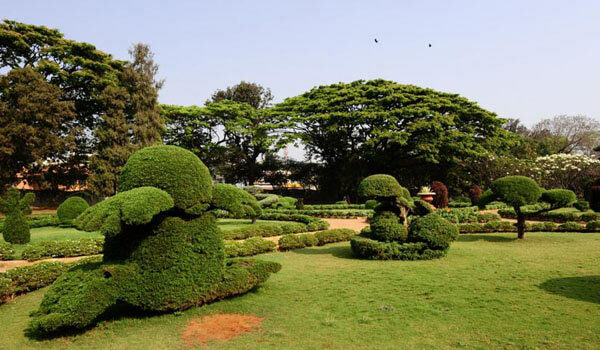 The Hyderabad Botanical Garden is located along the Gachipoli-Miyapor is the first Botanical Gardens in Hyderabad spread over 120 acres. The sections include medicinal plants, timber trees, fruit trees, ornamental plants, aquatic plants and bamboos. The Park has been designed to have large water bodies, Rolling Meadows, natural forests, rich grasslands and exquisite rock formations. 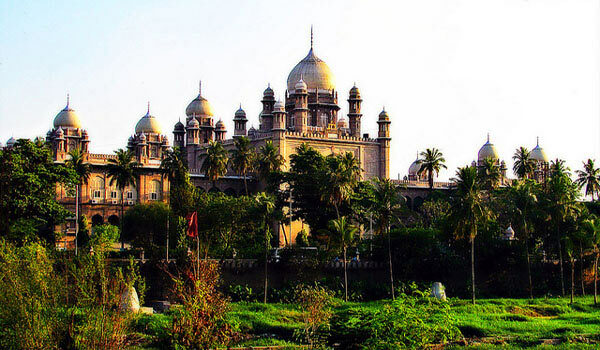 The Legislative Assembly happens to be the most majestic building of Hyderabad. 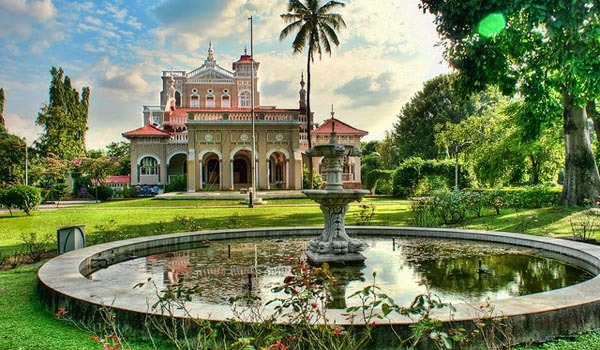 The high court is designed by the famous British architect Vincent Esch, this beautiful Mughal-style structure was constructed in the year 1916.The structure boasts of its local pink colored granite and red sandstone shaped panels. 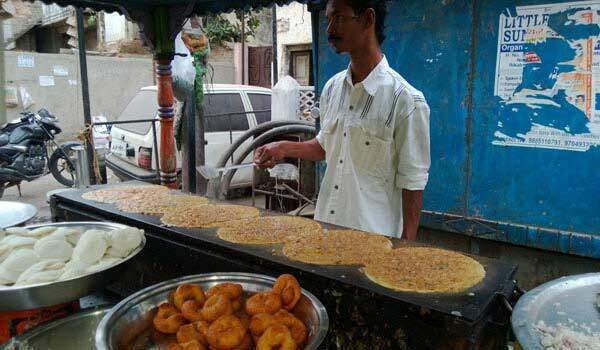 Help us to improve this article/list "Famous Tourist Places in Hyderabad". We would be glad if you can comment below and provide your valuable suggestions and feedback. If this page about Famous Tourist Places in Hyderabad have any wrong information/list or out of context content, then you can report us as well.